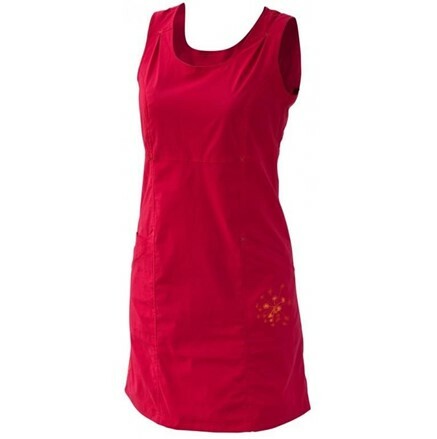 Women’s sportswear dress in a flowing cut with a zipper on the back. Smile Skin Stretch quality lightweight material provides you convenience during traveling and even both in the city and in the mountaineering. There are two large pockets on the sides of the dress, and one of them has a small inner pocket. Group of hitech fabrics, keeping human sking in comfortable climate. The material has the best features, breathable, flexible, elasticity, non-creasing and maintains a stable shape. Care about product is simple and due to the lower weight and suppleness of the material, products are easy packable for traveling. Spandex is a lightweight, synthetic fiber that is used to make stretchable clothing such as sportswear. Spandex fibers can be stretched to almost 500 % of their length and will return almost exactly back to original size and shape. The fibers are soft, and smooth. They are easily dyed. They are also resilient since they are resistant to abrasion and the deleterious effects of body oils, perspiration, and detergents. Nylon stands for a long chain of synthetic polymers, which became extremely popular in the textile business. Nylon was the first synthetic fibre ever produced. Nylon polymer is a high performance material used in plastic and fiber applications that demand exceptional durability, heat-resistance and toughness. Nylon fibers make material lightweight, tear resistant and extremely solid.